So, once again, the establishment is rushing millions of dollars into the Alabama race to put their boy (Luther Strange) into the Senate to fill seat of Sessions. Money should never ever again be allowed to win elections of establishment candidates. DC needs to be purged of these types who do not work for the people, but only the establishment. Make them lose again, Alabama! ELECT ROY MOORE, THE REAL AMERICAN MAN IN THE RACE FOR THE SENATE! MITCH NEEDS TO BE FIRED! #1 Roy Moore is a West Point graduate and a Vietnam Veteran who served his country in a combat zone - Luther Strange has never served in the military. #2 When not in public service, Roy Moore has been a small-time rancher and the President of a legal foundation that battled liberal groups like the ACLU and the Southern Poverty Law Center - Luther Strange was swimming in the swamp as a Washington lobbyist. #3 Roy Moore is a crusader who sacrificed two political jobs because he would not compromise his principles - Luther Strange betrayed his principles and let his greed get to him. He wanted to be a Senator so badly he sacrificed his integrity by taking a Senate appointment from disgraced Governor Robert Bentley, a man he was supposed to be investigating for criminal acts. #4 Roy Moore raised his campaign money from grass root conservatives - Luther Strange raised all of his campaign money from Washington insiders, Super PAC's and lobbyists. #5 Roy Moore is endorsed by Dr. James Dobson, the founder of Focus on the Family; Phil Robertson of Duck Dynasty; Chuck Norris of Walker, Texas Ranger; former Vice-Presidential candidate Sarah Palin, and former US Senate candidate Trip Pittman - Luther Strange is endorsed and bank-rolled by Mitch McConnell, the one insider who has single-handedly sunk the Trump agenda to repeal Obamacare and pass meaningful tax reform. #6 Judge Moore is an outsider loyal only to his God and fellow Alabamians - Luther is bought and paid for by Washington insiders and elites. #7 Roy Moore is a proven voice for the values and people of Alabama - Luther Strange is a proven yes-man for Mitch McConnell. THERE ARE TOO MANY SPINELESS YES BOYS IN DC. CHOOSE A MAN WITH A SPINE, ROY MOORE! What did Mitch offer to get Trump to support Luther Strange? Alabama Senate candidate Roy Moore, one of two Republicans competing in a primary runoff next week, appeared to use racially insensitive terms to describe Native Americans and Asians during a campaign speech on Sunday. Moore, a former chief justice on the state Supreme Court, lamented divisions between Americans based on race, mentioning â€œreds and yellows." 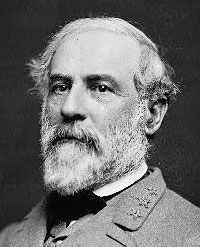 â€œWe were torn apart in the Civil War â€” brother against brother, North against South, party against party. What changed?â€� Moore asked in footage provided to The Hill by a Republican monitoring the race. The media is so intellectually dishonest. Its nice that the people now see this. Thx media for continually waking up more people as you twist everything. I predict Moore will win. The people are awake. Mr. Sessions, who was sworn in as attorney general on Thursday, was succeeded on the same day in the Senate by the attorney general of Alabama, Luther Strange, a former Washington lobbyist and onetime partner at a white-shoe Birmingham law firm with deep ties to the establishment wing of the Republican Party. Strange, Republican candidate for attorney general, once lobbied for the owner of the Deepwater Horizon rig that exploded in the Gulf of Mexico, according to federal records.As a Washington, D.C., lobbyist in the 1980s and '90s, Alabama attorney general candidate Luther Strange represented oil industry clients including the owner of the Deepwater Horizon rig that exploded in the Gulf of Mexico, according to federal records. Documents filed with the U.S. Senate and signed by Strange show that the Birmingham Republican was registered to represent Transocean Offshore Drilling Co. on matters related to offshore drilling in 1998. Transocean's corporate roots are planted in Alabama. The company was born in 1973 as Sonat Offshore, a subsidiary of Sonat Inc., a Birmingham-based natural gas utility that was an Alabama economic powerhouse for much of the 20th century. Strange was hired by Sonat in 1980 as a young lawyer straight out of Tulane University. He was promoted to head of the company's Washington office in 1985 and represented Sonat in Congress until 1994, when Strange left the company but continued to represent it as a contract lobbyist. 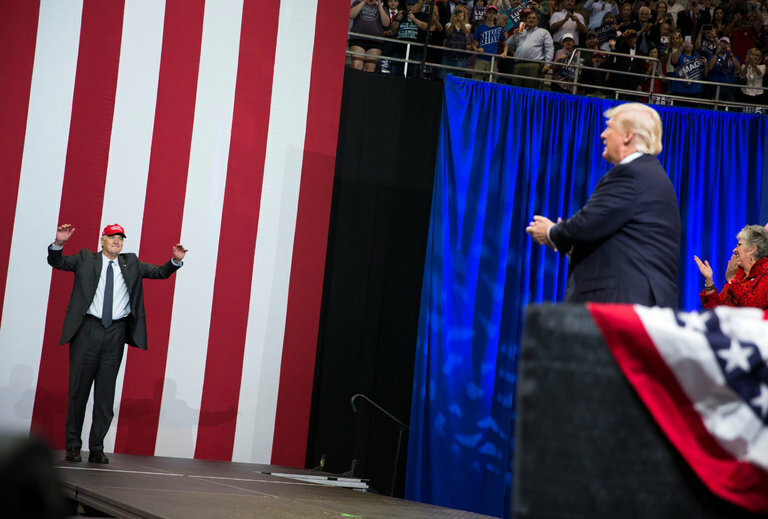 Many media reports note that it was Corkerâ€“in a meeting with the president last Fridayâ€“who finally convinced the president to campaign for Strange ahead of the September 26 GOP primary runoff for the U.S. Senate. The fight right now is in Alabama Senate race. Will Estab minions start jumping ship if Moore wins? Watch for the names of these people and then you judge if they were merely establishment "Yes men". I am glad hes backing off of the Strange endorsement a bit. Maybe someone finally told him the truth about Strange. Alabama Senate candidate Judge Roy Moore is eager to send a message to Washington, DC, and Senate Majority Leader Mitch McConnell on Election Day on Tuesday. â€œI hope it sends McConnell and the Senate leadership fund another message â€” is that they can be beaten and let them run scared for a while,â€� Roy Moore said on Sunday. Establishment forces have spent over $30 million in the race working to defeat Moore with negative advertising. Money did not work for Hillary, and it wont work this time. The people are awake to the fraud and arrogance of the Establishment. America is going to start choosing candidates with some integrity and whose actions match their words. They are also going to be choosing candidates who will work for the people. The swamp will be defeated. to go against the Dems ... a moot point if you ask me. Firebrand jurist Roy Moore has won the Alabama Republican primary for U.S. Senate, defeating an appointed incumbent backed by President Donald Trump and allies of Sen. Mitch McConnell. With the results now clear in Alabamaâ€™s hotly-contested U.S. Senate Republican primary race, the unambiguous message coming from the GOP voters responsible for Roy Mooreâ€™s underdog victory is clear-cut â€” a crucial reminder to everyone that Trumpism is not about any one person. Yes, Trump ran on specifics such as a border wall, the repealing of Obamacare, and tax cuts. Trumpâ€™s existential promise, though, the overall rationale for his insurgent campaign, was all about â€œdraining the swamp,â€� or taking the fight to the DC establishment â€” not just within the corrupt national media and the cancerous Democrat Party, but also within the Republican Party, which, as we have seen over the last eight months, is no better than the others. Trump defiantly violated his existential promise to us, the promise to drain the hideous DC swamp. In a different world, in a world where, for the last eight months, while in complete charge of the federal government, the Republican Party actually delivered on its promises; in a fantasyland where the GOP did not expose itself as a gang of feckless cowards unwilling to keep even the Obamacare repeal promise that defined the partyâ€™s existence for seven years, maybe Trump could have gotten away with supporting a Luther Strange. The reality is that the GOP chose instead to use their once-in-a-lifetime political opportunity to pander to media hoaxes and Democrats, to launch countless investigations against Trump and to push for citizenship for millions of illegal Democrats. Roy Moore WINS! AMERICA IS AWAKE AND KICKING THE GLOBALISTs, ESTABLISHMENT BUTTS! Their $30 million attempt to ram through their loser just vanished. Their money did not work for Hillary, now Strange! The people are awake! THE LOSERS WHO TOLD TRUMP TO SUPPORT STRANGE SHOULD BE REMOVED FROM OFFICE. ONE JUST ANNOUNCED HE WILL RETIRE, SEN CORKER. MCCONNELL IS THE OTHER ONE. HE NEEDS TO BE MOVED FROM HIS LEADER POSITION, IMMEDIATELY!.HE IS NOT A LEADER, BUT MERELY AN ESTABLISHMENT SHILL. Jared Kushner is said to be another. This guy is no help, and should be removed at some point or be released of his advisory job. 2 of 4 are gone. 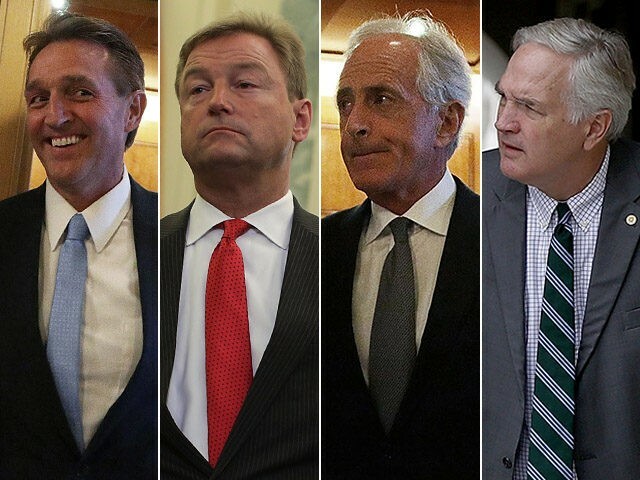 Time to send Heller and Flake home next. Which candidate did Trump endorse ? Alabama knew their candidates better than anyone. It was their choice. Sadly, Trump has many around him who give bad advice, and others that blatantly lie to him. Trump learned a lesson to not listen to shills. He is still learning who he can trust and who he cant trust. A few names just got added to his do not trust list. Alabama made a wise decision. You dont mess with Alabama! Alabama knew their candidates better than anyone. It was their choice. Sadly, Trump has many around him who give bad advice, and others that blatantly lie to him. Trump learned a lesson to not listen to shills. Yes an evil rumor coming from NeverTrumpers like Brietbart . . . ? Your left leanings continue to show. but you have a right to your views. The people love Trump, but were not going to be told who to vote for this time because they know Trump is misguided by losers in the Establishment, and they know fellow Alabamans better than he does. Whats so hard to understand? The people are finally standing up and using their brain. Thats a great thing because it shows they are awake. This is what is going to have a ripple affect all over America. MAGA! This awakening scares the crap out of the Establishment. Its past time they feared the people. Thats real Americana. America is back and fighting for its future. A great scene! This scares the crap out if the Establishment on both sides of the aisle. They can no longer con the public. Mooreâ€™s candidacy represents a referendum against the â€œswamp,â€� Boyle argued. â€œIf Alabamians send Moore to the U.S. Senate, they will be sending a message to the swamp in Washington, D.C., that they do not support Senate Majority Leader Mitch McConnell and othersâ€™ efforts to dilute the agenda that President Trump campaigned on,â€� he wrote. Dc, you just got a message from the people. If you cant do the job, Mcconnell, step down. Now, are you going to listen or continue being defeated by the people? If you cant show any integrity, or start working for the American people, its time to leave Washington. Just wait until the mid term elections. This is a warning. Losers, spineless, bought off shills will be sent home. ENOUGH! He is the REAL THING, Brother! He is 100% pure TNT about to hit the Senate! and DJT decided to go with Strange ... BUT we all know MOORE IS THE MAN! Montgomery, Alabama (CNN)All the Republican establishment's money and muscle couldn't stop culture warrior Roy Moore from ousting Sen. Luther Strange here Tuesday night. Now, suddenly, other outsider candidates see a much bigger opening to make Senate Majority Leader Mitch McConnell a villain and turn the party on its head in the 2018 midterms. This shows it can be done," said Danny Tarkanian, who is challenging Sen. Dean Heller in Nevada's Republican primary. "It shows the amount of money McConnell and his super PACs put in the race can't change the feeling that voters have right now." "Judge Mooreâ€™s spectacular performance and the support of the Alabamaâ€™s grassroots was a sign across this country that the grassroots is serious about draining the swamp, about repealing Obamacare, about getting rid of amnesty and building the wall and all of those substantive reasons that motivated people to give the Republicans the majority in the first place,â€� Cuccinelli said. 2018 mid term election - get rid of the establishment, rinos, spineless sellouts who dont work for you. No more chances, lowlifes! Time to boycott Meet the Press. They should be renamed Meet the Idiots. Isnt it amazing that people will work for a paycheck while lying to the people? Absolutely disgusting!